John Paul Strain Hand Signed and Numbered Limited Edition Canvas Giclee:"The Parting"
Size: 29 1/2" x 40" - Additional sizes and mediums will be listed for selection from the Drop down box. Edition Size: Artist Hand Signed and numbered Limted Edition, COA included. 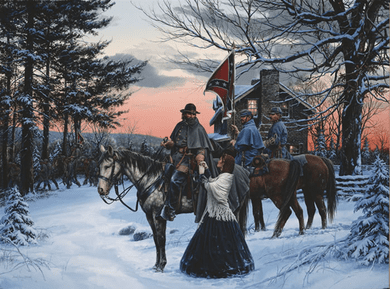 About the Art: Not even the biting cold of a Virginia winter could cool the affection shared by General A.P. Hill and his wife, Kitty Morgan Hill. Theirs was one of the war's great love stories. As commander of "Hill's Light Division" in Jackson's Corps of Lee's Army, Hill could rarely leave the army -- but Kitty tried to follow her husband. They enjoyed a marriage of devotion, faith and friendship which produced four daughters. Kitty Morgan McClung married Hill in 1859, when the general was a lowly lieutenant in the U.S. Army. They settled in Washington, D.C., where they became a popular couple in the capital's social circle. Their marriage, a daughter later recalled, was "an ideal one." But America's bloodiest war lay just ahead, and many of the army officers who were their friends in Washington would soon be made into enemies by the winds of war.